CINCINNATI – That was fast. Despite predictions of a long, drawn-out process, it took only one day for a jury to be seated in Ray Tensing's murder trial. Opening statements will begin at 9 a.m. Tuesday - almost a week sooner than expected. The 12-person jury includes: two black women, four white women and six white men. All four alternates are white women. That was only one of the surprises that came out of Judge Megan Shanahan's courtroom on Monday. Prospective jurors heard the first bombshell in the trial in the first hour of jury selection. Assistant Prosecutor Rick Gibson said the former University of Cincinnati police officer admitted that he "purposely caused the death" of Sam DuBose during an interview with Cincinnati Police homicide investigators. Gibson made the statement while addressing the first 14 prospective jurors. Tensing's defense attorney, Stew Mathews, immediately objected and Shanahan directed Gibson to "stay away from evidence." Less than a minute later, Mathews objected again and Shanahan called counsel into chambers for a conference. Gibson had just explained to jurors the difference between murder – purposely causing the death of another – and voluntary manslaughter. Tensing, who is white, is charged with both in the July 19, 2015 shooting of the unarmed black motorist during a traffic stop in Mount Auburn. Gibson said the state has to prove it was purposeful to make the murder charge stick, but he wasn't saying it was premeditated. That's why the charge wasn't aggravated murder. Later, Mathews hinted at his own surprise when he said Tensing had not stopped DuBose because DuBose was driving without a front license plate, as Tensing originally said. "It was something more serious than that," Mathews said, without saying more. Prosecutors say the trial shouldn't last long. "I think we're pretty comfortable that this case will be over sometime next week," Assistant Chief Prosecutor Mark Piepmeier told the prospective jurors. At the end of the day, more than 30 jury candidates were questioned, and each side made two peremptory challenges, meaning they dismissed two candidates from the pool without having to give a reason. Most candidates seemed to come willing and able to participate in the jury. Two prospective jurors were quickly dismissed from the first group because of answers missing from their questionnaires. One said he had already made up his mind about Tensing's guilt or innocence. Another said he wouldn't be able to sign a not-guilty verdict. Only one said she had not read or heard about the case. When asked, others indicated they could determine guilt or innocence solely on the evidence presented in the courtroom. Gibson acknowledged the tough road ahead for jurors. "It's going to be a difficult case all around. There's no sugarcoating it," he said. He called the photos of DuBose's head wound gruesome, but no one said they objected to viewing them. Mathews got a chuckle when he told prospective jurors he learned a lot about them from their questionnaires, particularly that many of them are "Big Bang Theory" fans. Mathews tried to play down the significance of Tensing's body camera video. He said the "relevant" part of the video is two seconds long and "we'll spend two weeks talking about it." Most of the prospective jurors said they had seen the video. Mathews said Tensing admits shooting DuBose, but the video only shows what the camera saw, not what Tensing saw or felt. He repeated what he has said before - that Tensing was justified in killing DuBose. In previous statements, Mathews said Tensing thought DuBose would run him over when DuBose started to pull away from the stop. 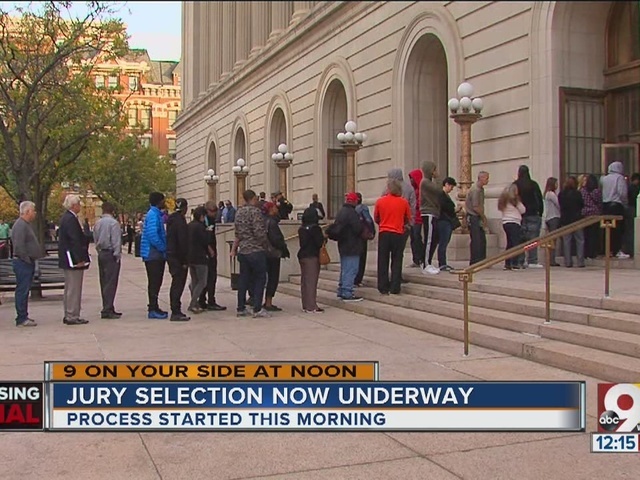 While most of the prospective jurors seemed to indicate they were willing to be on the jury, some were obviously not. After lunch, attorneys questioned another group about whether they could be fair and impartial. They encountered one candidate who wrote on the questionnaire that she "wouldn't want someone like me on the jury." The same person posted on Facebook, "Help. Get me outta here," referring to last week's jurors' orientation. 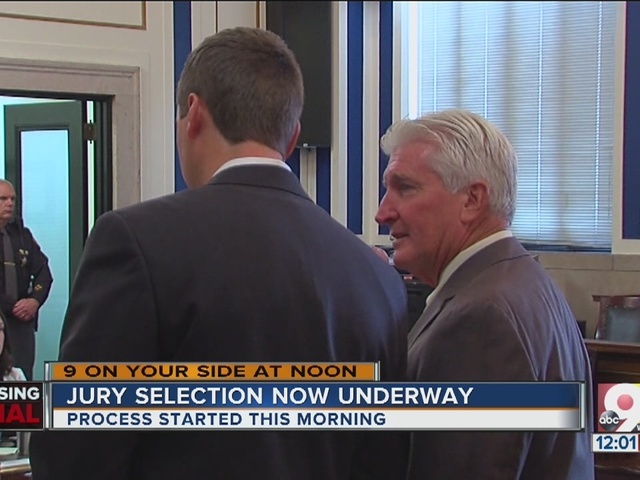 "You can't be on the jury," Tensing's attorney said bluntly. At the start of the day, Shanahan mentioned that many prospective jurors had expressed concern for their safety in the questionnaire. She assured them that their identity would be kept "strictly confidential." She said if any of their faces were shown on the courtroom video, the media outlet responsible would be "permanently removed" and the prospective jurors would be dismissed if they wanted to be. No names of prospective jurors were spoken. When attorneys addressed a prospective juror individually, they called them by a number assigned to them at orientation last week. Outside the courthouse Monday morning, about two dozen protesters - some wearing Black Lives Matter shirts - chanted, "Say his name. Sam DuBose" and "What do we want? Justice." The gatherings were peaceful. Shanahan referred to the protesters, telling the prospective jurors they "would not be subject to any goings-on outside the courthouse." She said she was not at liberty to say yet how that would be guaranteed. No spectators or media were in the courtroom - only Tensing, counsel, the judge and prospective jurors. Reporters watched on a big screen in a courtroom down the hall. The judge ordered the one video camera positioned behind the defense table so it wouldn't show prospective jurors. As a result, livestream viewers mostly saw the back of Tensing's head. Tensing, dressed in dark suit and white shirt, occasionally took notes left-handed with a black and red pen and sipped from a plastic water bottle. Otherwise he appeared to look straight ahead.